This unique combination of filters creates clean drinking water that has been filtered to 1 micron. Economical to use, there is no waste water. This unit has the perfect balance of efficiency and practicality. This filter improves both the taste and quality of your water. 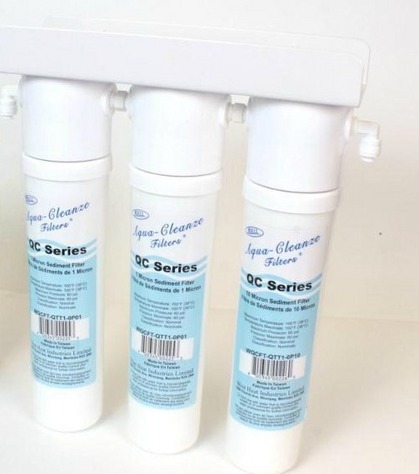 It reduced the chlorine, as well as objectionable odors and sediment. Water filtration also reduces the following hard water contaminants that may be present in your water: lead, copper, barium, chromium, mercury, sodium, cadmium, fluoride, nitrite, nitrate, selenium, aluminum, arsenic, sulfate, calcium, phosphate, iron, magnesium, zinc, chloride, silicate, cyanide, sulfate, bacteria, potassium, nickel, silver, bicarbonate, manganese, and ammonium. Say good-bye to... costly bottled water and heavy water lugging. Enjoy great tasting water today! No more bottles of water to carry home! Get unlimited... fresh, delicious drinking water right at home for drinking, cooking, ice, coffee, tea, juices, baby-formula, pet, beauty washing, dietary, medical uses, and plants watering. Filtered water = 1¢ /gal. You save $ 0.99/gal. ● Easy to install under counter and just as easy to change filters with the quick change design. Whole House 3 Stage Water Filter System $299 - SAVE!